The pressure measurement is performed similarly to the way it is in humans. A small area of fur is clipped and an inflatable cuff is fit snuggly around the foot or foreleg of the pet. Sometimes the base of the tail can be used. The cuff is inflated so as to occlude blood flow through the artery. In a person, as the cuff is slowly deflated a stethoscope is used to listen for the point when the blood pressure is adequate to pump through the partially occluded vessel. This point on the pressure gauge is the systolic blood pressure. The cuff is further deflated until the vessel is open and no more sounds are made. This point represents the diastolic blood pressure. In animals, the stethoscope just is not sensitive enough and an ultrasonic signal in the cuff is used. Using ultrasound, the sound of the pressure is converted into an audible signal. There are numerous diseases in pets that are associated with high blood pressure. By taking blood presure, we can check for hypertension (high blood pressure) which may indicate an underlying heart, kidney or thyroid disease. 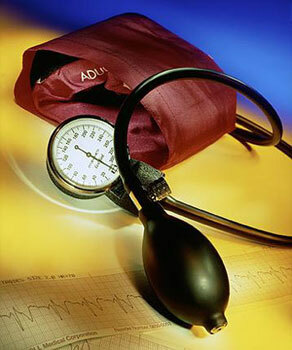 Hypotension (low blood pressure) may also indicate a problem with the cardiovascular or endocrine (hormonal) systems. In humans, high blood pressure is frequently considered primary, meaning there is no other disease causing it. In animals, primary hypertension is unusual; there almost always is another disease causing it and if routine screening does not identify the problem, more tests may be in order. The contraction of the heart occurs due to electrical impulses that are generated within the heart. ECG is a measure of the heart rhythms and electrical impulses. It is a non-invasive and safe method of diagnosing heart disease or screening for heart disease prior to anesthesia. However, chest x-rays and cardiac ultrasounds are often required to diagnose the exact cause in most heart disease. With an ECG, electrode leads are attached to the patient's arms, legs, and chest. These leads record the electrical activity while the patient rests. The image comes up on the computer screen where detailed analysis of the ECG can be studied to determine whether or not there is heart disease. An ECG should be run on any patient showing clinical signs of heart disease including rapid or slow heart rate, irregular heartbeat, episodes of fainting, difficulty breathing, chronic cough, or any patient undergoing anesthesia. Heart disease is one of the top three causes of death in older pets. Early detection is the most effective means of managing heart disease and allowing the pet to live a relatively normal life. Glaucoma is increased pressure in the eye. It is recognized in nearly all breed of dogs, but several breeds are more susceptible. Hereditary glaucoma is usually observed in middle-aged dogs and, while it will eventually affect both eyes, it may not develop simultaneously. Glaucoma can also be seen secondary to eye trauma, eye tumors and uveitis (inflammation in the eye). The hallmark of glaucoma is a dilated pupil. Usually there is no pupillary response to light in a glaucomatous eye and the eye is blind. The cornea is also usually cloudy, ranging from mild to dense. Blood vessels in the sclera (the white part of the eyeball) are usually congested as well. Any abnormality seen in the eye could suggest glaucoma. Therefore, it is important to screen as soon as possible. With an electronic instument called a Tonopen, we can quickly check your pet for glaucoma. This involves a topical anesthetic on the surface of the cornea and lightly touching the Tonopen probe to the corneal surface. The test is painless and takes only a few minutes. Time is of the essence in treating acute claucoma. Even 24 hours of elevated intraocular pressure may be enough to cause permanent destruction of the optic nerve. This results in permanent blindness. Chronic glaucoma is caused by an eye that went untreated in the very early stages. All of the above signs are present, with the addition of an enlarged eye. Dogs or cats with enlarged eyes rarely respond to medical treatment, therefore, if the eye is causing chronic pain, it is best to have the eye surgically removed. Successful treatment of glaucoma depends on accurate diagnosis of the problem and vigorous medical and/or surgical treatment. There are numerous drugs available to treat glaucoma, as well as several surgical procedures that work well in dogs. Remember, recognizing the warning signs of glaucoma and seeking immediate veterinary treatment is essential. A pulse oximeter is a non-invasive medical device that measures the amount of oxygen in a patient's blood. A pair of small diodes are attached to a translucent part of the patient's body, usually an ear or tongue. The oximeter is attached to a medical monitor so staff can see a patient's oxygenation percentage during surgery, recovery & emergencies. Radiographs are very useful tools for looking at problems in your pets. Our on-site, X-ray equipment provides very high quality radiographs to aid in the diagnosis of many disorders. We have the SOUND SMART DR™ full digital system which was designed to be the easiest, most intuitive digital radiography system ever created specifically for veterinary use. All images can be reviewed by board certified radiologist and images can be sent around the world. Ultrasound is used to create 2-dimensional grayscale images of internal structures in the interest of obtaining a medical diagnosis. Images are created by placing a hand-held scanner called a transducer on the skin surface which sends pulsing high frequency sound waves into the body. These waves bounce off their intended target and return a real time image to a computer screen. Most people associate ultrasound with pregnancy as it is utilized to visualize fetal development; however, it has many more applications. Ultrasound is very effective at diagnosing and monitoring disease in the heart, liver, kidney, bladder, spleen, prostate, uterus, eye and intestinal tract. This technology allows us to diagnose many diseases without having to perform surgery or aids us in determining whether or not surgery is needed. Of course we also use it for pregnancy diagnosis. We also can take tissue samples from inside the body using the ultrasound as a guide so we can avoid surgical biopsies.